If you’re on a strict budget, you’re probably wondering about the best things to buy at the dollar store. The idea of buying items for significantly less is quite appealing. While the quality of some items may be poor, there are lots of real bargains to score. They include party supplies, personal care items, household items and food. Also, you should note that there are different types of dollar stores. At Dollar Tree, most things cost $1 or even less. However, at Family Dollar and Dollar General and others, items can cost up to $10 although lots cost a $1. With that said, here are 87 great discount store buys. You can get party supplies at the dollar store for as much as 70 percent less than elsewhere. If you need festive tablecloths, streamers, and party favors, or just paper plates and cups, head to the nearest discount store and save some cash. Throwing a party doesn’t need to break the bank. A dollar or less can get you the birthday, anniversary or Christmas card you need. There’s no need to spend $5 or more unless you really need fancy ribbon and textured paper. Get a cheap card and write a heartfelt sentiment the recipient is sure to love. Some of the best things to buy at the dollar store are envelopes, bubble wrap and packing tape. If you go to the post office, the cost will be much higher. You’ll find bandages, gauze and antiseptic ointments at the dollar store for a fraction of the cost at pharmacies. Good to Know: If you don’t mind not having popular brand names in your first-aid kit, you can save up to 50 percent. Whether you want to write your to-do list or keep notes in classes and meetings, you shouldn’t have to spend a fortune on notebooks. If you have kids who go through books quickly, you have an even bigger incentive to seek out the best prices. This is another area in which you definitely don’t need to splurge. You may get as many as four markers for the price of one when you head to the dollar store. These items often end up in the trash within five minutes so you should spend as little as possible. You may not get all the bells and whistles you would get from the fancy gift store, but the bags and boxes will serve the same purpose. Do you need cool pool floats or games for poolside? If so, a great place to check is your neighborhood dollar store. Have a backup flotation device on hand if you’re worried about the quality of the floats. When you want to get rid of clutter, you probably head to the store for containers. If you’re not shopping at the dollar store, you may be spending a lot more than is necessary. Good to Know: For just a few dollars, you can get containers for clothing, toys, and just about anything else. If you want to keep your kids occupied, puzzle and board games are a great idea.Since they are likely to begin losing pieces almost immediately, why spend more than $1? Ensure your home or office never runs out of this essential. Coffee filters cost a lot less at the dollar store and if you think about it, they really aren’t worth a lot. Whether it’s a scarecrow at Halloween or shiny balls for the Christmas tree, you’ll find lots of options at dollar stores. Reminder: Lower priced holiday decorations are some of the best dollar store finds. Kids will often need poster board for their class projects, and they may not remember until the night before. Having some cheap boards on hand at home can really help in a pinch. When they cost just $1 or less, stocking up is easy. If the only eye problem you have is focusing on close objects, you may only need reading glasses. Those at the dollar store can be just as helpful as the more expensive ones you can get in other stores. Pro Tip: Schedule an eye exam if you have problems seeing at long distances as well. Rubber gloves are among the best things to buy at the dollar store. You need to protect your hands from germs and harsh chemicals, but you don’t need to spend a lot to do so. Buy a few pairs the next time you pass by the discount store. Bobby pins always seem to disappear so you can never have too many. However, the dollar store also gives you the opportunity to get large packs of headbands and scrunchies for just $1. You can also get combs and brushes for cheap. If you’re wondering how to buy cheap books, the dollar store may be just the place to look. You’re unlikely to find the latest New York Times bestseller but you can get a decent selection of reading material. Good to Know: Children’s books, crossword puzzle books, and religious-themed tomes are often on the shelves. Pregnancy tests can cost up to $15 in the grocery store. You can get them for just a buck at some dollar stores and they are just as accurate. Tote bags come in handy when you’re going to the store, heading to the beach, or just taking some items to a friend. They can disappear quickly so stocking up at the dollar store makes sense. These foil pans cost about half as much in the dollar store. If you need to bake something for a picnic or potluck, a disposable tin can come in handy. Since you’ll be throwing them away, it’s best to save your money. Even though you’re on a budget, you probably still want your home to look great. Dollar stores usually carry vases in quite a few designs, and you can also get decorative glass bowls for a buck or two. Bread is a staple in many households. Some dollar stores sell well-known brands of loaves and bagels for only $1 in comparison to $2.50 or more at the grocery store. Pro Tip: Remember to check the expiration date so you use or refrigerate the bread in time. Mugs are good discount store buys and the quality is pretty much the same as what you get in other stores. Not only are they cheaper, but you can buy exactly how many you need instead of having to purchase a set. You’ll often find popular brands like Tide and Clorox for just $1. Whether you need multi-purpose cleaner, bleach or detergent pods, you may be able to find what you need at a discounted price. If you want nice dishes that will do the job even if they aren’t top quality, the dollar store comes through yet again. Cheap dishes are especially appealing if you have little kids who may drop the crockery. Pro Tip: If you’re a busy single mom looking to save, the dollar store is a great resource of baby stuff as well. And if you’re looking for more money-saving tips, check out our dedicated article. Cookie sheets don’t need to be pricey. If you bake often or you make large batches of goodies, you likely need lots of them. Consider getting a few from your neighborhood dollar store. Food containers may cost up to $5 at the grocery store and some brands of food storage bags are expensive. If you’re on a budget, this is not ideal since plastic containers have to be replaced often. You definitely don’t need to spend more than is absolutely necessary on cotton swabs. Pro Tip: Brand makes very little difference in quality and you can get a box at the dollar store for just over half of the usual price. To save some money, purchase your picture frames from the dollar store and paint them or jazz them up in another way. Your walls can look great without you having to spend a fortune. If you or your kids want to get crafty, you don’t need to need to go overboard with spending. You can get foam shapes, beads, sequins, and decorative tape for just $1. If you take your own candy to the movie store, you can get a bargain in dollar stores. Go shopping around holidays like Halloween or Valentine’s Day to get the best selection. When every penny counts, you don’t want to make any bad purchases. Double-sided tape may not be the most expensive thing, but you pay even less at the dollar store. You probably don’t want to buy dollar store clothing, but the socks can be of a decent quality. Whether you need them for yourself or your children, you’ll find some acrylic or spandex blends on par with department store options. Index cards are important for test prep or giving a presentation and are one of the best things to buy at the dollar store. You can get a pack for under $1 in some discount stores, so you have no excuse for not having some on hand. Washcloths are also some of the best things to buy at the dollar store. Good to Know: You can often find ultra-soft and absorbent microfiber cloths for face and body and some specially designed for babies. Most stores have matching bath and hand towels. Dollar store flashlights aren’t top quality but if the power suddenly goes out, you’ll be glad you bought a couple. You can get a small one to keep on a keychain or in your car in case of emergency. Plastic buckets are great for temporary storage, household cleaning, and washing cars. If you’ve realized you need to get a bucket, skip the trip to the hardware store. You’ll find lots of different colors and sizes at a dollar store near you. If you need shoes for communal showers, the beach or the pool, look no further than the discount store. These stores have lots of cheap colorful flip-flops from which you can choose. Some may even last a couple of years if you don’t lose them. You’ve probably had to buy a small pack of pain relievers on the go when a headache suddenly came on. Even if they were expensive, you got them anyway because you just wanted the pain to go away. Pro Tip: If you want to be prepared next time, get two or three packs for $1 and keep them at work, in your car or in your purse. Hardware stores often sell plant pots for more than $10. However, you can get them much cheaper in dollar stores. If you have a green thumb, you’ll love the discounted pots. You can probably get two or three bottles of spices at the dollar store for what you’re currently paying the grocery store. If you want to try a new spice for the first time or you know you’ll only use it at one time of year, there’s no need to spend a lot of money. If you end up tossing the spice away, you won’t feel guilty. Even if you like popular brands like Hefty and Glad, you can find them at dollar stores. Good to Know: You can pack your lunches for almost a third less than you currently do at the grocery store. Cheap sandwich bags are especially convenient and affordable for large families. You should get rid of your kitchen sponges every two to three weeks to prevent the spread of germs. It, therefore, isn’t wise to spend a lot of money on them. Pro Tip: Dollar stores sell multiple sponges in a pack for $1, making them some of the best dollar store finds. Many teachers take some of their own supplies to the classroom and it can get expensive. Some of the basic things you need like pencils, sharpeners, and sticky notes are readily available at the dollar store. This makes it much more affordable to get things for the entire class. Dollar store foil comes in a smaller roll than what you will get at the grocery store. However, if you need it and you don’t have lots of money, this option will work in a pinch. Toothbrushes need to be changed every three months or immediately after illness. Plus, you may need to have some on hand for overnight guests. Luckily, dollar stores have them for almost a third of the price offered by other stores. You’ll even find name-brands like Colgate. Buy your wrapping paper in bulk during the holiday season and it should last for the next year. You can get rolls of assorted designs for birthdays, holidays and other occasions. Whether you want them for lounging or DIY projects, you can get three-packs of white T-shirts for a lot less at the dollar store. If you need to get a couple at the last minute, don’t bother with department stores when there’s a dollar store near you. These basic cleaning items can cost up to $15 in some stores, but you really don’t need to pay that much. You can get brooms and dustpans for just a buck in dollar stores. If you don’t mind generic products, you can get your hair-washing essentials at a very low price. Good to Know: The ingredients in dollar store shampoos and conditioners are pretty much the same as those in other products. You may still need to try a few different options until you find which products work best for you, but it’ll be at a much lower cost. When you need items for goodie bags or just little thank-you gifts, the dollar store has a lot to offer. Grab candy, toys, games, household products or beauty items depending on who the recipient is. You’ll find something for everyone. Some dollar stores have decent tools. You won’t find large power tools, but you’ll get what you need for a basic toolbox. There will likely be hammers, screwdrivers and tape measures which are essential for any handyman or woman. If you want to be able to do small jobs around the house, start collecting supplies at the dollar store. If you’re now starting out and you need to outfit your kitchen on a budget, the dollar store can be a major help. You’ll find bowls, cutlery, crockery, tongs, spatulas and just about anything else you can think of. They usually look great and they can last quite a long time. Canned and other shelf-stable foods are some of the best things to buy at the dollar store. However, you need to make sure you’re actually getting a bargain by doing some price comparisons. You also need to ask yourself whether you’ll really eat the food or if you’re buying because it’s cheap. Having good spending habits is key to making sound dollar store purchases. Whether you want to create a romantic atmosphere or just have a lighting source during an emergency, you can’t go wrong with dollar store candles. You’ll find tea lights, pillar candles, scented jar candles, and more in store. You can also get some dollar store batteries for short-term use. They are convenient if you need to power a small flashlight or keep your remote going until you get your usual batteries. Good to Know: Dollar store batteries don’t last as long as more expensive ones, but they are a lot cheaper. You probably don’t ever want to run out of toilet paper or paper towels. Even if you have your favorite brands which you get from other retailers, it can’t hurt to keep some cheap ones stashed away in case you need them someday. Plastic utensils are great for informal parties. There’s less washing up to do and you don’t have to worry about your good cutlery disappearing. The next time you’re having guests over, prepare with a visit to the dollar store. Do you use hydrogen peroxide for minor cuts or generic benzoyl peroxide for acne? If so, you can pick them up at the dollar store for less. Some people find these products work just as well as more expensive skin products. Spray bottles can be of great help around the home. If you make your own bathroom or window cleaner, they are invaluable. Pro Tip: Retailers vary significantly in how much they sell spray bottles for, but you can be sure of a bargain at the dollar store. Tissues are a guaranteed throwaway item and you can never have too many. Stock up on them at the dollar store and ensure every member of your family has some. Keep them in the car, your desk at work and in your purse so you always have a pack close by. Wipes are another product you’ll want to have close at hand. You can use them to clean your hands when you’re on the go, wipe up spills or even clean your desk after the weekend. They basically make any type of cleaning super easy. If you want a more environmentally friendly cleaning option, get microfiber cleaning cloths. They can be used dry for dusting and wet for a thorough cleaning. These are designed to pick up dirt and residue especially well to ensure your home is spick and span. You don’t need name-brand petroleum jelly. The dollar store version will work just as well to heal dry skin, soothe cracked hands and soften lips. You can even use it to highlight your cheeks. It shouldn’t cost a lot to send a thank you card or a simple note of appreciation. You can find a good selection of note cards at most dollar stores and the quality is quite good. Even when you choose affordable cards, the recipient will appreciate your sentiments. If you want brightly colored or patterned band-aids or those with popular characters on them, head to the dollar store. Band-aids either have to be changed quite frequently or they don’t have to be on for long, so it isn’t necessary to buy expensive ones. Your little one will love them no matter where they’re from. Whether it’s the office or the classroom, pens and pencils disappear quickly. People borrow them and never return them, or you simply misplace them. For everyday writing needs, dollar store pencils and pencils are best. You can also pick up pencil lead for mechanical pencils. Clutter increases stress and makes it hard to focus. If you’ve been putting off tidying your space, go to the dollar store and get some cheap organizers to help you get things in order. Pro Tip: If you’re looking to get rid of stuff you’re not using anymore – in particular old tech and media, check out Decluttr. Even in this technological age, some people prefer a good old-fashioned puzzle book. The dollar store is a great place to pick one up if you like to do puzzles when you have time to kill. Crossword puzzles also make great small gifts for other people. If you’re a teacher or a parent, you know kids love stickers. However, they usually quickly shift their attention to something else. The next time you go to the dollar store, grab a few fun stickers including some gold stars to reward them for a job well done. They get a fun incentive and you keep some money in your pocket. It’s crazy how lint, fuzz and even pet hair seem to attach themselves to everything. Lint rollers make it easy to return clothing to its pristine nature, so you look professional and well-groomed. Bonus Tip: You can also use them on cloth blinds or lampshades. Trashcans make great discount store buys. Schools, offices, and homes all need them, and they shouldn’t cost a lot. This is one of the foods you can buy from the dollar store without fear. Store them in the pantry for emergencies or just occasions when it’s too difficult to cook a full meal from scratch. Getting basic spaghetti sauce and adding your own spices and meats is a great idea if you’re trying to save money on groceries. You can prepare a hearty meal for your family without breaking the bank. You’ll find dishes, canned food, and treats along with toys, collars, and leashes at the dollar store. These will almost always be a lot cheaper than those at the pet store. Your animal definitely won’t know or care where the items came from so save yourself some money. Dollar store earbuds can save the day if you leave your usual ones at home. They also ensure you can listen to your favorite music or podcasts if you need to get new fancy headphones, but you can’t buy them as yet. Off-brand USB chargers are also a great quick fix if you don’t have your usual charger on hand or if you need a temporary option. Good to Know: They are unlikely to last as long as the name-brand manufacturers’ product, but they’ll keep your device juiced up for a while. If you have the common cold or flu and you need a little relief, you can get brands like Theraflu and Vicks at heavily discounted prices. The next time you feel symptoms coming on, go to the dollar store instead of the pharmacy and keep some money in your pocket. You can get makeup even cheaper than that in the drug store if you make a beeline for the dollar store. While some stuff will be from unknown brands, you can also find Elf, Wet n Wild, Rimmel, and Maybelline products. If you want to experiment with colors or formulas, makeup is one of the best things to buy at the dollar store. You may be uncomfortable giving your baby brands you’ve never heard of. However, you can find brands like Gerber at the dollar store, allowing your little one to eat their favorite foods even though you’re on a budget. Every woman knows sanitary items can get quite expensive. Luckily, some dollar stores carry Playtex and Tampax at lower prices, making that time of the month a little less stressful. Whatever kind of soap you need, you can find it in dollar stores. Liquid hand soap, dish soap and soap bars are all likely to be in abundance. Sometimes you’ll even come across some of your favorite brands at a good price. If you need cool glow sticks and other glowing toys for a kids’ party, there’s no better place to get them. Choose from very affordable sunglasses, wands, bracelets and more. Give your home or car a nice fragrance without spending a lot of money. You’ll find many different styles and many different scents from which you can choose. If you struggle to keep plants alive but you like the look of them, get some artificial ones from the dollar store. Options range from cacti to roses so you can create the garden of your choice for as little as possible. If you’re travelling by air, you may not be able to take all your toiletries with you. Or, maybe you’re staying at home, but you want to try some new products. Whenever you need small portions of toothpaste, skin care products, or hair styling products, travel-sizes are a great idea. If your skin isn’t sensitive or problematic and you get good results with disposable razors, buy them from the dollar store and you’ll likely get the best prices. 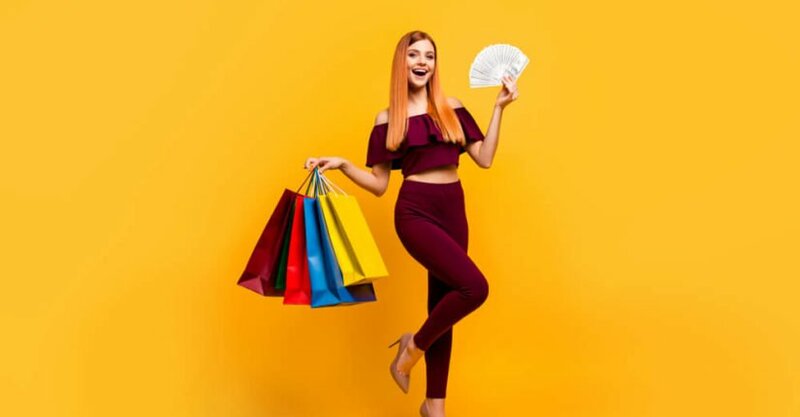 For even more savings when you go shopping for the best things to buy at the dollar store, use a cashback app or coupons. You may end up getting some items free! What are your favorite dollar store products? Let us know below.